With the "Island City" of Minocqua Wisconsin serving as the center, the Lakeland Region provides the most famous vacation region in the state… and fishing is the top draw. Again, as with other areas covered by these books, lakes are generally the result of the recent glacial era. Dams play a role, including the Minocqua and Kawaguesaga watershed, which is tributary to the Wisconsin River via the Tomahawk River. Walleye and muskie often are the top choice, but largemouth bass, smallmouth bass, northern pike and panfish resources must not be overlooked. 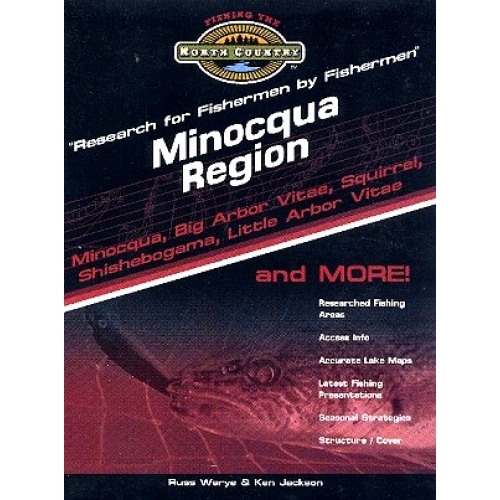 Clearly, the headliner lakes are Minocqua, Kawaguesaga, Big Arbor Vitae, Clear, Little Arbor Vitae, Squirrel, Squaw, the Pike-Round Chain, Shishebogama, and Gunlock lakes. Several of these lakes rank among the premier inland fisheries of the state. And wilderness lakes are also available that necessitate a portage through state forests for those pursuing quiet and solitude. The adjacent towns and communities of Arbor Vitae and Woodruff create a large continuity in the region. Numerous facilities are available for the visiting angler - resorts, motels, campgrounds (public and private), quality tackle shops, restaurants, shopping, and excellent medical facilities. Additionally, this area serves the entire north-central region of the state, as its size and location on U.S. Highway 51 attracts summer visitors from the other northwoods communities. Some of the lakes included in this book are: Amik, Arrowhead, Benedict, Big Arbor Vitae, Bittersweet, Bolger, Booth, Brandy, Buckskin, Bug, Bullhead, Carrol, Clear, Curtis, Devine, Diamond, Dry, Erickson, Franklin, Gunlock, Hemlock, Hurrah, Johnson, Kawaguesaga, Little Arbor Vitae, Little Bass, Little Spider, Madeline, Mercer, Mid, Minocqua, Oberlin, Otto Mielke, Pauto, Pike, Prong, Punch, Roach, Round, Scaffold, Shishebogama, Smith, Squaw, Squirrel, Sunday, Towanda, Turner, Vandercook, and Verna lakes.